My love story with you started a long time ago. I can still remember the first time I went on a hunt for you in the woods. I know. A hunt doesn’t seem like a good start for a love story, but it was love at first sight, or should I say at first bite. Following my grandmother’s footsteps, I was searching for you, under the fallen tree leaves, amongst the fragrant moss, behind giant trees. You had many names: bolete, cep, black trumpets, hedgehogs, chanterelles, morels, toadstool, rosé des prés… all sounded so mysterious, like creatures living in fairy tales and story books. Some of you were princesses, knights or cute rabbits and could be cherished. Others were witches, demons and other vilains. “Watch out for these! Never touch them!” my grandmother would say. For many years, you all became part of a life story I woud treasure, filled with childhood memories, woody scents and family recipies: mushroom omelettes, forest mushroom fricassée, cream of mushroom soup, mushroom risotto. So many ways to cook you. All delicious. All so unforgettable! 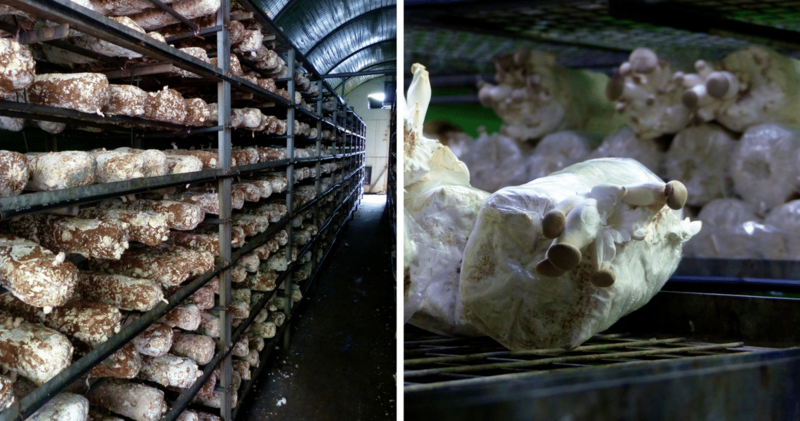 Then one day I found myself visiting a mushroom farm in Singapore. It was thousands of kilometers away from my home country, so distant from my culture. Suddenly a whole side of the fungi kingdom with exciting new fruits was revealed to me. I can tell you, even with my strong mushroom knowledge, it took me by surprise. A good one! My sense of smell and my tastebuds were in for a great ride! On the shelves of several buildings, lined up in the dark, I discoved an entire family branch of my childhood friends. Enoki, shiitake, oyster mushroom, royal abalone, these words were unknown to me until that day. In a climate-controlled hut, with a temperature maintained between 12 to 16° C, I got to know you even better, to discover how you are grown, nowadays, in these farms, to find yourselves on the supermarket shelves of the world. I wandered around the obscure alleys of the cool sheds. Kilometers of racks were filled with sawdust logs, pierced with holes and injected with mushroom spawn. After several weeks, the delicate and snowy mushrooms appear. A first harvest can be done, picking only the mature subjects. Another crop follows. This cycle continues for three to four months until the production runs out. The humidity is kept high to increase the development of the fungus. This was a whole different environment from the one I was used to. Additionally, your highly nutritional and medicinal properties are undeniable, and desirable all over the world. I soon became intimate with your Asian cousins. I don’t feel a bit guilty about it! I love the shiitake mushroom, the king of mushrooms, for its firm flesh, its fresh and woody taste, and its high healing properties. How wonderful just sautéed or added to a miso soup. I learned to choose the ones with dark hats marked by deep white lines in a flower-like shape. Its health benefits are numerous. The long and thin enoki soon became close friends and regular visitors in my Asian soups. With their crunchy and milky white body, their fruity and delicate flavor, they are so delightful. And what about the oyster mushrooms! They are the second most cultivated mushroom in the world after the bottom mushroom or Champignon de Paris. Easily grown, their species are many, like the king oyster mushroom with its thick flesh and rich flavor. Don’t worry. I won’t forget you, my fungus friends. Since this memorable visit, my appreciation of you just became so much profound, expanding my palate and olfaction horizon. It was so exciting to find new cooking companions while retaining my old ones. I can even keep you closer by growing you right at home with one of the ‘grow your own mushroom’ kit! See you next time in my kitchen, pals. Until then, stay fresh and cool! 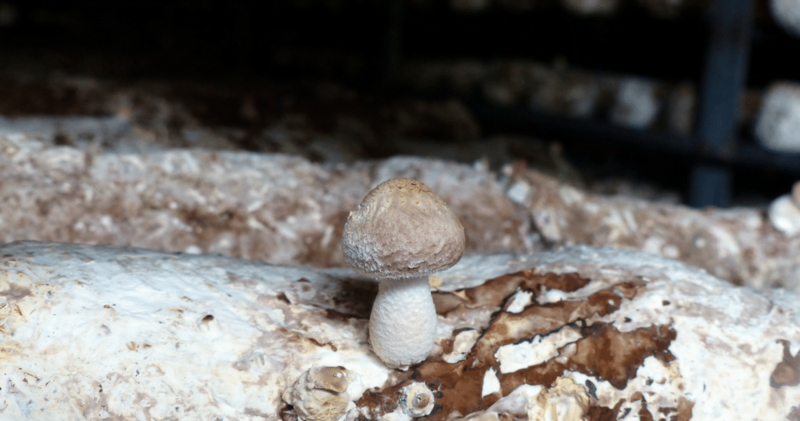 12 Responses to "How a Peek in a Mushroom Farm in Singapore Changed My Life"
Thank you Arnie. I was very inspired! Thank you Natasha. I truly enjoyed writing this piece. I am happy you loved it and share my love of these cute fungi! Thank you. Living in Asia was definitely a life-changing moment in so many ways. If you didn’t have your moment, may be your life doesn’t need it! Ha Ha what an offbeat and quirky post i must say but hay we all love mushroom. i especially love a good mushroom gravy on top of a sirloin beef steak. Thank you Mark. Mushroom gravy sounds delicious! Thank you. You are so right! They each have their own personality and it just doesn’t seem fair to leave one or the other out! Let’s indulge in all of them!